Enjoy your favorite rich flavors in our Coconut Cream Cupcakes. 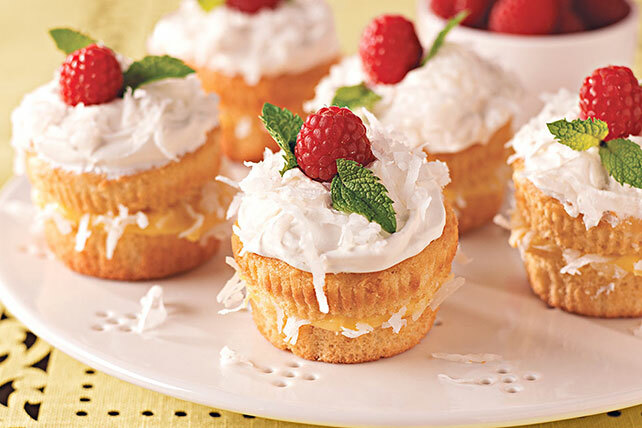 These Coconut Cream Cupcakes are filled with a luscious mixture of coconut and pudding. Prepare cake batter as directed on package; stir in 2/3 cup coconut. Spoon into 24 paper-lined muffin cups. Bake 20 to 25 min. or until toothpick inserted in centers comes out clean. Cool cupcakes in pans 10 min. Remove from pans to wire racks; cool completely. Meanwhile, beat pudding mix and coconut milk in large bowl with whisk 2 min. (Pudding will be thick.) Refrigerate until ready to assemble cupcakes. Remove cupcakes from liners; cut cupcakes horizontally in half. Place cupcake bottoms on tray. Top each with 1 Tbsp. pudding and 1 tsp. of the remaining flaked coconut; cover with cupcake top. Spoon frosting into medium bowl. Add COOL WHIP; whisk until blended. Spread onto cupcakes. Garnish with remaining flaked coconut, raspberries and mint. Since these delicious cupcakes have built-in portion control, they can help you keep tabs on portions.